We offer a small selection of jewelry clasps. They are used in necklaces and bracelets, as well as some some interesting non-jewelry applications. We'll also share some ideas about how high-end jewelry makers create unique magnetic clasps. Warning: Written by an engineer, this article is likely to be functionally informative, but probably won’t include beautiful jewelry you actually want to buy! 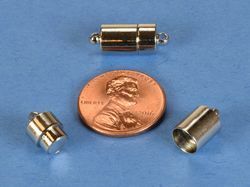 Two CL2 Jewelry Clasps, shown connected and separated. Some Magnetic Jewelry Clasps are made specifically for the job. They come with two halves. They’re sold as a matched pair. The halves are made with a magnet that has a housing around it, made of non-magnet material. A small metal loop on the end lets you attach the chain of a bracelet or necklace. The CL3, gold plated CL3G and smaller CL8 are perfect examples. The CL2 is unique, designed a little differently. The two magnet housings fit inside one another when clasped, preventing side-to-side or shearing motion between the magnets. A setup like this can provide a sturdy hold without requiring as much magnetic strength. 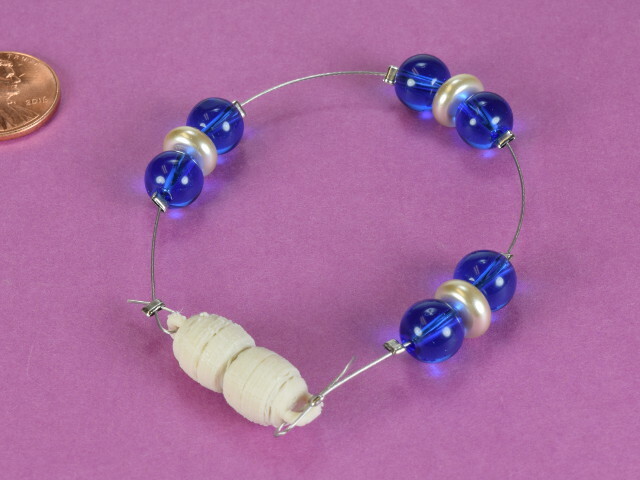 A CL8 on a bracelet. Two R414CLG ring magnet pairs. The R414CL ring magnets are also popular. These don’t have any special housing around them. They are plain ring magnets, except the hole is stepped. 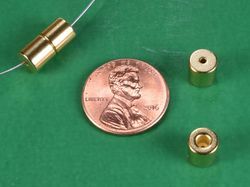 This step allows a cord to be knotted or crimped and held securely, while allowing the magnets to connect together flush. This magnet is a bit larger at 1/4" diameter, with a bit more magnetic strength. It’s has great holding power! A disadvantage is that it’s purely a neodymium magnet, which is a hard, brittle material. If allowed to slam together, the magnets might ultimately damage one another. Also available in black nickel as the R414CLB and gold as the R414CLG. 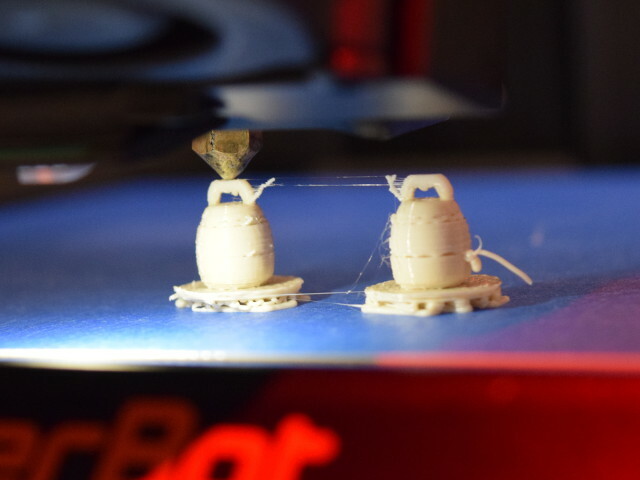 Cutaway view of D44 cylinder magnet inside a 3D printed magnetic bead. These magnets are popular for crafting and beading. You don’t often see these exact clasps used on higher-end jewelry, though. What are professional jewelry makers using? Jewelry makers don’t like exposed nickel plating, since some people can be allergic to nickel. In moist, wet environments, nickel plated neodymium magnets can corrode (rust) over time. Encasing them protects the magnets from exposure to moisture. 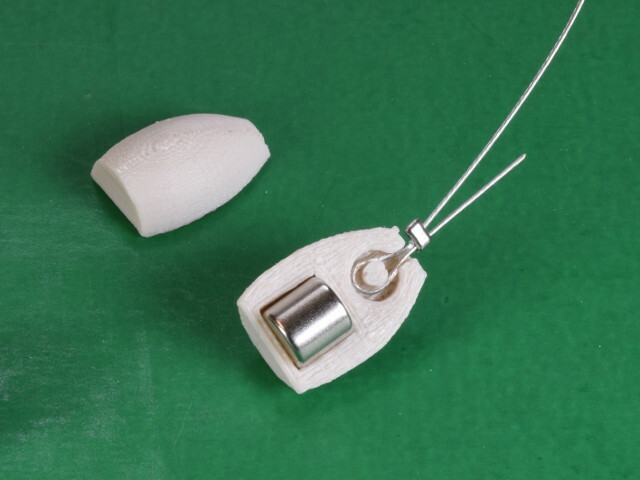 While having a layer of plastic or bead material can reduce pull force, a thin layer can also protect a brittle neodymium magnet from damage due to impacts. A simple disc or cylinder magnet can be used. 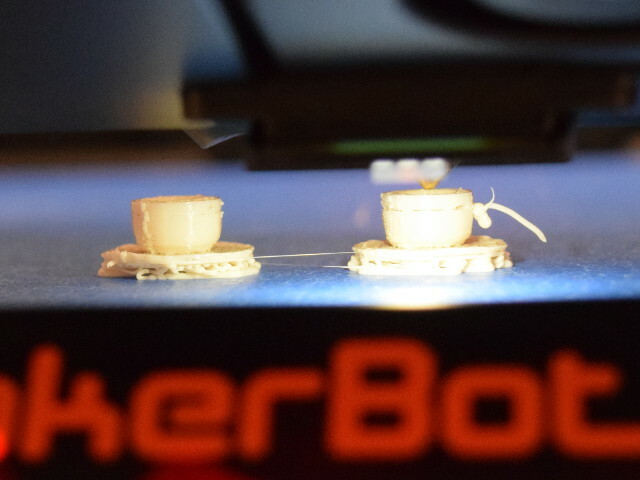 The photos here show the basic idea with some 3D printed “beads” we made. They’re certainly not as pretty as some jewelry we’ve seen made with our magnets, but they do show the basic idea. We tried four sizes, using D24, D34, D44 and D54 magnets in diameters ranging from 1/8" to 5/16". The D24 were a bit weak, but the D34 felt strong enough to provide a nice hold. 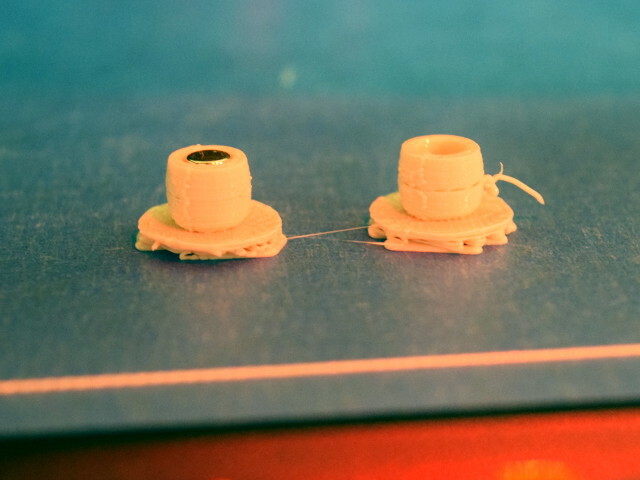 We made a pair of magnetic clasp beads ourselves by 3D printing a "bead," but pausing halfway through to insert the magnet. When we let the printer resume the print job, the magnet was sealed inside. The clasps on a bracelet! Why should I use Magnetic Clasps? There are pros and cons when comparing Magnetic Jewelry Clasps to traditional split-ring, lobster or barrel clasps. The unique traits of magnetic clasps can be considered their strengths and weaknesses. For example, if you're wearing a necklace with a magnetic clasp, you could unclasp it simply by tugging on the necklace. If you pull hard enough, the magnets will release and come undone. You could say this is a feature, since it prevents anything on the necklace from breaking. It also reduces any choking hazard. On the other hand, you might say it's a downside, because the hold is not as strong as some other clasps. It's a tradeoff you'll want to consider when choosing magnetic or any other clasp style. A clear win for magnetic clasps is jewelry for folks who have a sickness, handicap or impairment that prevents them from using typical clasps. If your hands lack the dexterity to clasp and unclasp jewelry, magnetic clasps make it easy. 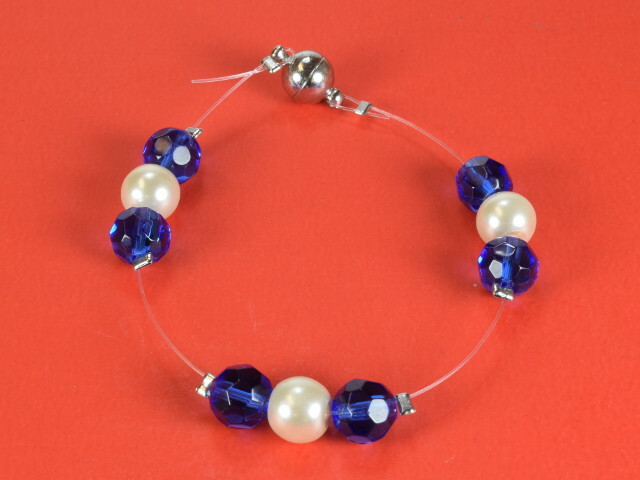 Necklaces and bracelets can be put on and removed with just one hand! We've heard from many customers who find other uses that we never imagined. While these magnets are sold in pairs, some of the most ingenious applications use the magnet halves separately. Adding crystals to chandeliers is becoming very popular. If you search Google Images or Pinterest, you'll find a lot of great examples. Each half of the jewelry clasp can have a string attached, which also holds a crystal or string of crystals. We've heard about other decorative things done with them, from streamers at a wedding to hanging things from the metal strips in a dropped ceiling. Your imagination is the limit! Drop us an email if you have some creative uses we haven't mentioned.